The firm that paid Mueller his ¥130k is the International Data Group (IDG), a subsidiary of China Oceanwide Holdings Group. IDG owns many information technology publications and venues, including security-focused CIO.com and csoonline.com. China Oceanwide announced acquisition of the IDG on January 19, 2017 – the last day of the Obama administration. A closer look at the China Oceanwide structure and operation of the IDG suggests that the IDG was acquired by China to serve as an espionage and influence vehicle. Note that China has an annual surplus of $375B in the trade with the US. Trump’s policy to reduce or even eliminate this deficit makes him an exceptionally inconvenient US president for China. But in exchange for ¥130k and a promise or expectation of future China-related income, former FBI Director Robert Mueller publicly announced his support for the anti-Trump theory of “Russian hacking” and made the key decision for his future investigation as Special Counsel. It is not known whether this deal with China led Mueller to seek the appointment as Special Counsel, but Mueller also lied about this transaction in his financial disclosure. When appointed Special Counsel tasked with investigation, Mueller didn’t bother to even pretend he was investigating. It looks like the ¥uans have done the investigation for him. Mueller used the results of this “investigation” to launch an unprecedented prosecution of the elected President. Even the alleged Intelligence Community Assessment (cooked by John Brennan and James Clapper using the Steele dossier and oddly interpreting the DNC refusal to collaborate with the FBI on its suspected Russian hacking as the proof of Trump-Russia collusion) did not go that far. The ICA was announced on January 6, 2017 – and refuted within hours! Two days later, Fox News published a long article by former CIA analyst Fred Fleitz Was Friday’s declassified report claiming Russian hacking of the 2016 election rigged? In few weeks, Brennan’s hostility towards Trump and the refutation of CrowdStrike allegations of “Russian hacking” of Ukrainian artillery finally exposed ICA as a hoax. CrowdStrike was the DNC contractor that incorrectly attributed the DNC hacking to Russia in May-June and doubled down on this misattribution in December 2016. The MSM made huge efforts to keep the narrative going until Mueller breathed new life into it. At that time, his witch hunt was in full swing and hardly anybody was paying attention to his disclosure. Mr. Lu Zhiqiang officially became the Chairman the Board of IDG on March 29, 2017. When people hear of this article without reading it in full, they are often incredulous. It is hard to believe that Robert Mueller sold out for $24k; the article didn’t actually say that. In addition to this amount, there was expectation of future business dependent on the government of China. 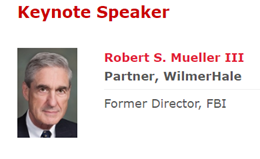 After the publication, I found out that Mueller probably had past obligations to China from his work in WilmerHale. More importantly, I think Mueller underestimated what he bargained out. Because of his perceived authority as a former FBI Director, Mueller was asked to go to a Chinese-sponsored conference related to U.S. cyber-defense/security, and to voice his support to some lies beneficial for the Chinese interests. The “Russian election interference” narrative was not only undermining President Trump, but also pushing Russia away from the U.S. into an alliance with China. A decent man would neither go there nor say what Mueller did. Mueller did both, and his compensation much exceeded $24,000. From that point forth he went down a slippery slope. When presented with an opportunity to become Special Counsel with power to damage or even eliminate Trump, he might have been compelled to back his words with actions. Then, he found out he could not back out from the whole affair. This is a classic story. Where I grew up, similar stories set in daily circumstance were taught to children to warn them away from crime. Many of Mueller’s accomplices in #spygate also started with what they thought was small misconduct with very low probability to get caught. Then the actions of their accomplices aggravated their own crimes, and they were faced with the choice that street gangsters have: rat on your accomplices and they throw you under the bus by them, or stay in the ranks of your gang and try to fight your way out together. Lying on the financial form about $24k received from what looks like Chinese intelligence, and the unprecedented refusal to disclose conflicts of interest serve as evidence of the guilty mind. The conflicts-of-interest waiver granted to Mueller by Rod Rosenstein and other officials of the DOJ deserves a separate notice. The initial (2018-10-11) version of the article is preserved at https://archive.is/IMfzy. Unrelated: among all critics of the “Russian hacking” conspiracy theory, only the Veteran Intelligence Professionals for Sanity (VIPS) gained some attention from the MSM. That might be because their key argument – the calculated speed of data copying – is wrong. They made other inaccurate statements, too.